I love hand me downs. Whether it be for the baby or for myself, I'm always game to receive (and pass on) previously-loved items. Why shouldn't we be helping each other out this way, especially in this bad economy? As we all know, though, the thing with children's hand-me-downs is that we must make sure that they are absolutely safe before using them. So, we check the web for product recalls and look over clothing and toys for loose strings, buttons, etc. But sometimes we can miss something that is not so obvious because it hasn't be recalled and/or the previous owner hasn't had any problems. 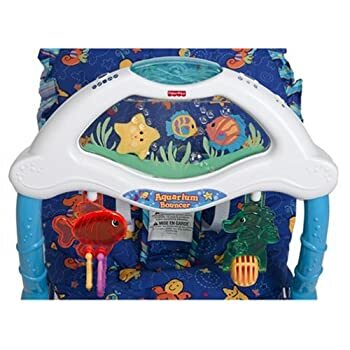 Case in point: I inherited a 5-year-old barely-used Fisher Price Ocean Wonders bouncer. The product hasn't been recalled and all the parts are in perfect working order. Yet, even though the product is like new, I've found that there is a design flaw that can hurt your little one. I really feel bad that I didn't catch this problem earlier, but I've learned a valuable lesson. In addition to checking for recalls and damaged parts on items old AND new, you must also use a keen eye to determine if its very design features will be safe for your child. Sometimes design flaws get through even the most rigorous of product testing and mama must serve as the final product tester. You can bet I'll be going over future baby items with a (figurative) magnifying glass! Health and happiness to you and your little ones! Oh no! I'm sorry he hurt his little toe!